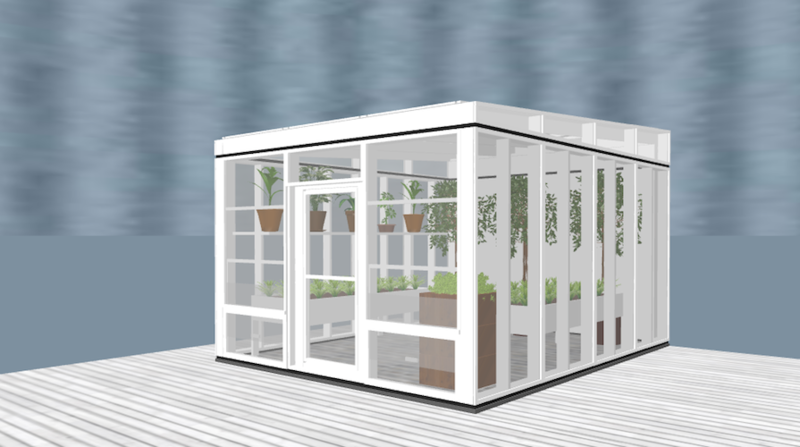 A small, stand-alone greenhouse. Openable vents on the front walls and at the top of the roof panels enable air flow and cooling during hot weather. A compressed earth block floor provides thermal mass storage. Barn Raising photo by Alexander W. Galbraith. Group Photo of Aquaponic Greenhouse Workshop by Joshua Langevin. Aerial photos of Aquaponic Greenhouse Workshop by Reid da Silva. Most furniture, decor and plants used in 3D models by the SWEET HOME 3D community. Open Source Hardware logo by Macklin Chaffee. Most icons by the NOUN PROJECT community: House icon by Les Vieux Garçon, Meeting icon by Ainsley Wagoner, Network icon by Brennan Novak, Cash Register icon by Brad Goodwin, Hexagons and Mushrooms icons by Creative Stall, Tree icon by Cagri Yurtbasi, Clock icon by Martin Smith, Solar Home by Chiara Rossi, Computer Programmer icon by Thinkful, Rainwater Tank by Luis Prado, Wood Fireplace by Geremy Good, Solar Panels icon by Justin Blake, Brick Wall icon by Sergey Demushkin, Haystack icon by Addylord, Toilet icon by Carlos Salgado, Timber Plank icon by Korokoro, Tools icon by Antistatique, Drawing icon by Paul Boardman, Cash Register icon by Jean-Philippe Cabaroc, Globe icon by Simon Child, Web Designer icon by Mazil, Doors icon by Megan Brown, Documents icon by Bonegolem, Ribbon Banner icon by Andrew Was, Cordless Drill icon by Matthew Hall, Collaboration icon by Krisada, Circular Saw icon by Botho Willer, Farm icon by Bonnie Beach, Greenhouse icon by Ferran Brown, Rooster icon by James Keuning, Worm icon by Nick Kinling, Cauliflower icon by Gregory Sujkowski, Larvae icon by Anton Gajdosik, Bed icon by Pham Thi Dieu Linh, Stove icon by Arthur Shlain, Shower and Bath icon by Diana, Sofa icon by Mmejule, Desk icon by Chris Thoburn, Bed icon by Parkjisun, Rocking Chair icon John O’Shea, Boot icon by Fabio Meroni, Bookcase icon by Parkjisun, House icon by Ecem Afacan, Preferences icon by Mikael Bonnevie, Presentation icon by Creative Stall, Window icon by Trace Lexington Byrd, Bookshelf icon by Oliviu Stoian, Hinge icon by Ryzhkov Anton, Wheelbarrow icon by Nicolas Vicent, Sprout icon by Gayatri, Solar Panels icon by Adam Terpening, Light Bulb icon by Till Teenck, Excavator icon by Andy Selimov, Cement Mixer icon by Clément Payot, Walls icon by Dilla Chee, Roof icon by Luke Patrick, Pavement icon by Guillermo Guso, Paint Bucket icon by Julien Meysmans, Stove icon by Anjan Shrestha, Battery Charger icon by Icon Island, Diploma icon by Guilherme Simoes, Architect icon by Dan Hetteix, Factory icon by Ana María Lora Macias, Rain icon by Jennifer Cozzette, Dirt icon by Shawn Erdley, Wind icon by Joost Haar, Wind Power icon by Maurizio Fuzillo, Rock icon by Artem Kovyazin, Material icon by Dilla Chee, Brick icon by David, Mirror icon by Ralph Schmitzer, Pellets icon by Fabio Rinaldi, Triple Tandem Bicycle by Piotrek Chuchla, Mailbox by Chameleon Design. Content by Open Building Institute is licensed under a Creative Commons Attribution-ShareAlike 4.0 International License.